Rhonda Gale Jackson obituary. Carnes Funeral Home. 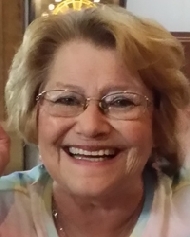 Rhonda Gale Jackson, sixty-two, of LaMarque, Texas passed away unexpectedly Saturday, June 27th, 2015 at her home. A Celebration of Life will be held Saturday, July 11th, 2015 at the VFW in Dickinson, Texas at 1:00pm. Rhonda is preceded in death by her mother, Josephine Marie Overbeck; her beloved aunt, Oneto Aleene “MeMe” Ivie; and grandson, Dusty Castillo. She leaves behind her legacy in her father, John E. Overbeck Jr.; her husband of twenty-two years, Marvin Jackson; daughters, Tonya Mann, Rhonda Jackson (Amanda), Jennie Gore (Jerry); sons, Michael Jackson (Tammy), Todd Trilicek (Mekisha), and Kevin Ellis; grandchildren, Jesse, Kristen, Zackary, Shayna, Aaron, Aiden, Austin, Jackson, Matt, Katie, Taylor, Stephen, Chris, Jake, Kari and Paisley; great-grandchildren, Riley, Reneseme, JR, Chloe, Chevy, and Leonidas; Sister, Cheryl Eskew; Brothers, Joe Overbeck and John E. Overbeck III; numerous nieces, nephews, other relatives, and some of the BEST friends that she could have asked for.